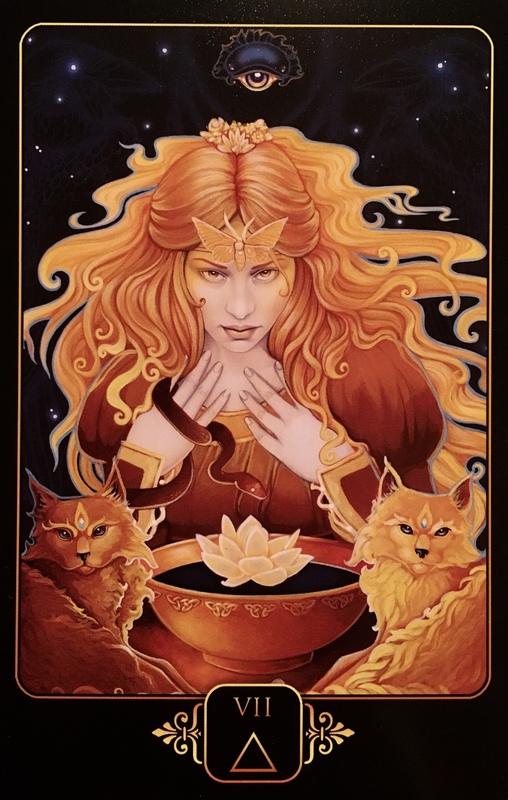 Card Meaning: “The Seven of Fire represents the development and use of one’s intuition to see the way forward, and predict possible outcomes. Intuition is that gut feeling – it is an instinctual or unconscious knowing – that, when you heed it, can keep you safe from making mistakes, and lead you to being in the right place at the right time. It is a feeling of recognition that we often ignore, but if we choose to heed, can have us moving through life in harmonious accord with our surroundings. However, to trust in one’s intuition requires that you look within and determine what the message means to you personally. You can ask the advice of another. You can seek guidance from another. But only you know your answers. Personal interpretation is key. Trusting in the knowledge that is stored within your unconscious mind is key. Potential Blockage: “Divination means to foretell or predict the future. Sometimes, our intuition guides us, and at other times it is a simple awareness born of observation and paying attention. At other times, it is a marriage of both. Every day we are given signs that, if heeded, can reveal what is to come. The Seven of Fire reversed, represents a need to watch for those signs and heed the insights they offer. Observe the people around you. Look closely at patterns of behaviour that repeat, and pay attention to words spoken that lack mirroring actions. Take not of promises broken, overreactions to questions, an inability to meet the eyes, and laughter that seems forced or contrived. They are all indications that there is more going on. Learn to watch. Learn to listen. Heed what your observations and senses are telling you. If you have a tendency to dismiss them, don’t. Don’t ignore them. If your gut tells you something is not as it seems, then look beyond the surface and see what is truly there… and then address it. Use your intuition. What is it telling you? This is your Higher Self, your Soul, talking to you. This is the way the guidance comes, through your body, through the whisperings of your heart. What feels light and right? What feels like it’s missing, or doesn’t sit well with you. Watch the people around you. Watch for actions matching words. This is authenticity, when promises are kept, and behaviour matches the talk. If they are not walking their talk, then you walk in the opposite direction, that one is not for you! Do not override this guidance, it is a precious gift. Yes, you are right, trust in yourself. If you feel that feeling, and you just know something is not as it seems… trust that you are correct and wait for confirmation, it will come. Then listen to it and distance yourself. Create boundaries that allow you to assess the situation without getting dragged in, hook, line and sinker! Earth Angels and Lightworkers want to see the best in everyone, believe me, I KNOW! And yet, unfortunately, not everyone is in the place in their lives to give you their best, and you cannot fix them, or work on their potential for them. But you can bless and release them and let them go their own way, it is after all, their journey, just as this is yours. Listen to yourself. Do not justify the behaviour of another for any reason. Be honest and true to you.